Products with thick walls or different wall thickness have for a long time been difficult to cure with an even quality. The combi-oven concept makes it possible to process components with a great variety of wall thickness. The components are fully covered without any gloss or colour changes. The latest wet paint applications are water based paints, e.g. Electrophoretic (ED), which are more environment friendly in comparison with earlier systems. 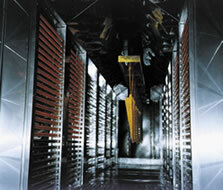 As it is more difficult to dry off water than solvents, the demands on the drying/curing equipment are increasing. Both concepts are designed for high speed air resulting in increased energy transfer and more accurate temperature control compared to conventional systems.